In the high-pressure world of professional sports, where aggressiveness is often seen as a sign of a strong leader, Super Bowl-winning coach Tony Dungy broke the mold. Dungy, known for his quiet style, told the crowd he has always chosen his words carefully, especially when he felt frustrated on the sidelines. “When I’m angry, I say, ‘You’ve got to be kidding me. When I’m really angry I say, ‘You’ve GOT to be kidding me.’” Whether leading a sports team, a team of colleagues or a family, he believes in building up rather than breaking down and putting others first. Sitting on stage in a director’s chair between Wake Forest President Nathan O. Hatch and Vice President for Career Development Andy Chan, Dungy talked about the triumphs and challenges of team building and the importance of staying true to your own style. The question-and-answer program was the inaugural event of the Leadership Project, a new initiative that engages students and the community in a personal and reflective conversation with leaders who span diverse career paths, generations and worldviews. 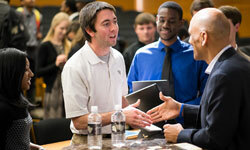 Students had time to talk with Dungy one-on-one during his campus visit. “If you look at any organizational chart, the CEO is at the top, then you move down the line to the workers. The problem is, you always feel if you’re at the bottom, you’re not that important,” said Dungy. Instead, Dungy puts the coach on the bottom and the players at the top. The message to the team is that the coach supports the structure, and the leaders are everywhere in the organization. Dungy led the Indianapolis Colts with MVP Peyton Manning to a Super Bowl victory in 2007, the first such win for an African-American coach. He joined the Colts in 2002 after serving as the most successful head coach in the history of the Tampa Bay Buccaneers. 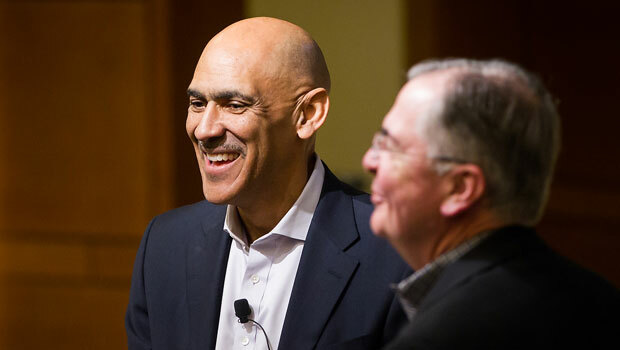 Widely recognized as an inspirational champion both on and off the field, Dungy has authored several books on topics such as living life with integrity, courage, strength and purpose. Leaders have to be grown, he said. People have to be given a chance. And when the opportunity comes, doing the right thing over and over and over again is the way to stand out.